1) I had my very first craft tutorial with the wonderful Julie at Bee Crafty in Bidford where I learnt: how to correctly use stamps, what the various types of ink pad can do, how to mask off certain parts of your stamped image, and how to use embossing inks/powders. I would wholeheartedly recommend that all newbies attend a craft tutorial or two - you can learn so much and have great fun at the same time. 2) I came home and used my new found knowledge along with a fabulous new Wild Rose "For Men" clear stamp and created an image that I coloured in with my Promarker pens (colouring-in pens for grown ups!). Not having done much stamping or colouring in before, I am quite proud of the result. 3) I then used the image to make my very first easel card - these are so easy to do (once you know how!) 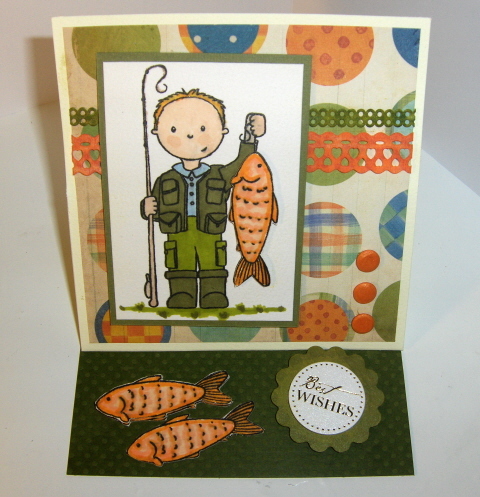 I stamped a few extra fish and attached them to the image and card using 3d foam, which gave them a little more depth. The two border papers running across the card were colour tinted with my ink pads to match the colours on the backing paper. Then finally as always, I just had to use some card candy to finish it off. All in all I've had a fabulous day. Thank you - I love it too, I honestly think it is my best card to date.